An 800-kilometre drive, stiff student competition and little time – these were the obstacles that were easily overcome by Laurier Faculty of Science student Emils Matiss at the HackPrinceton event held in New Jersey over the March 31 weekend. Matiss and his teammates Susan Wang (Princeton University) and Mostafa Okasha (McMaster University) finished in the top 10 and won Best Virtual Realty/Augmented Reality Hack for their product, EyeSee. 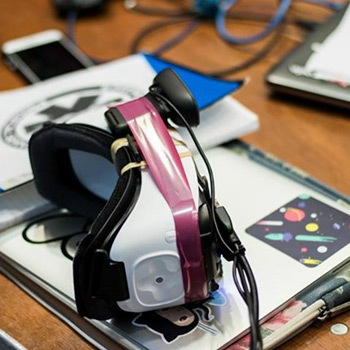 An assistive headset for those with limited sight, EyeSee generates high contrast images streamed from a web camera. It also detects and enhances the outlines of common objects – further improving visibility for the end user. Built on a Mac operating system with Python 3.5 and open-source computer vision (OpenCV), the team then leveraged a Canny edge detector and a brute-force matcher (BFMatcher) to recognize and refine the imagery. Physics and Computer Science professor Ilias Kotsireas, who supervises Matiss’ research in the Computer Algebra Research Group Ontario (CARGO) lab, is excited for his student’s future. Matiss and his teammates are looking at ways to simplify the device in addition to developing a free app to be compatible with inexpensive virtual reality headsets. The group also has plans to consult with an optometrist to discuss how to optimize EyeSee’s image output for other sight impairments. Approximately 500 undergraduate and graduate students from across North America participated in the event, which featured challenges issued by sponsors such as IBM, Viacom and Amazon Alexa.